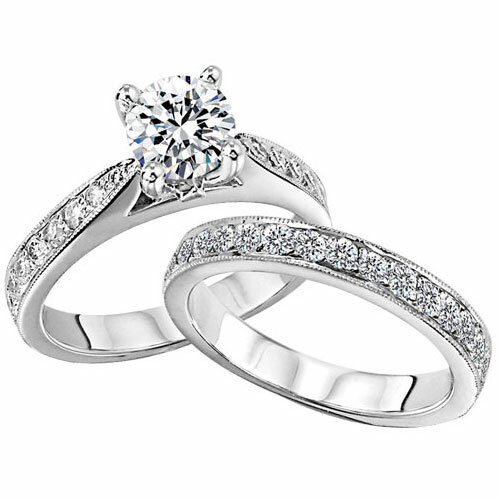 Wedding bands are a symbol of love, and the round shape is a symbol of eternity. Dating back to ancient Egypt about 4,800 years ago a band was woven out of reeds and plant life. The rings were an outward demonstration to the world of love and commitment. Too often, wedding bands become an afterthought. We get wrapped up in the engagement ring and the planning, and we forget about the bands and how special and important they can be. Even a simple gold band can be personalized with a thoughtful, hand engraved, inscription. We invite you to browse our wide variety of wedding bands and find the design which best fits your taste.